A person’s readiness to date is largely a matter of maturity and environment. Friendship is not a gift, but is the result of hard work. A wedding is and event, but marriage is a life. 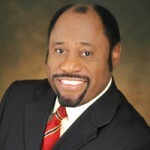 Dr. Myles Munroe is the president and founder of the Bahamas Faith Ministries International and Myles Munroe International, a Christian growth and resource center that includes leadership training institutes, a missions agency, a publishing company, a television network, radio and Web communications, and a church community. He is chief executive officer and chairman of the board of the International Third World Leaders Association and president of the International Leadership Training Institute.